Fiberglass gritted plate is a tough, corrosion resistant floor plate. 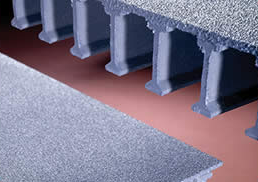 SAFPLATE®’s unique combination of pultruded fiberglass plate and an anti-skid grit surface creates textured solid sheet flooring that is ideal for both wet and dry environments. Used in a variety of applications such as trench covers to contain vapors and fumes or pedestrian bridge walkways for sure footing, SAFPLATE® provides a long-lasting maintenance-free alternative to steel plate for severe, corrosive environments. SAFPLATE® is available as solid plate or bonded to DURADEK® or DURAGRID® grating. The standard surface is fine grit. A medium grit or a coarse grit is also available. SAFPLATE® can also be customized to meet the requirements of a variety of applications. Standard SAFPLATE® has a Class 1 flame rating of 25 or less per ASTM E-84 and meets the self-extinguishing requirements of ASTM D-635. 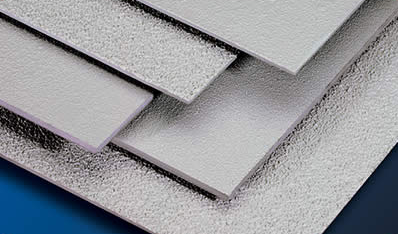 SAFPLATE® with fine grit is stocked in 4′ x 8′ panels in standard EXTREN® plate thicknesses of 1/8″ and 1/4″. Optional plate thicknesses include 3/16″, 3/8″, 1/2″, 5/8”, 3/4″ and 1″ sizes. Standard SAFPLATE® is Series 525, which is fiberglass reinforced polyester with fire retardant in a gray color. Other resin systems and custom colors are available upon request.